New User Interface Design, Custom WordPress PHP & CMS Responsive framework utilizing BootStrap, Custom Visual Design of logo, Custom Visual Design of hero banner. RG Staffing is a boutique recruitment firm. The agency is well established within the Atlanta market with over 30 years of continuous success. They specialize in not only industry specific talent, but also a wide array of diverse talent. 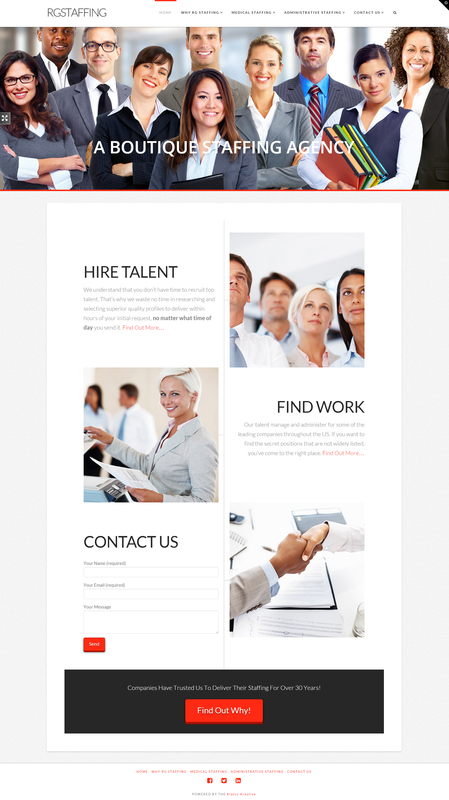 The last version of their corporate website, www.RGStaffing.net, had not been updated since 2008. In order to stay in live with their prestigious level of service, their online presence needed a long overdue face-lift. The objective for Klazzy Kreative was to develop a presence that presented potential clients with the overall mission of RG Staffing without offering information overload. 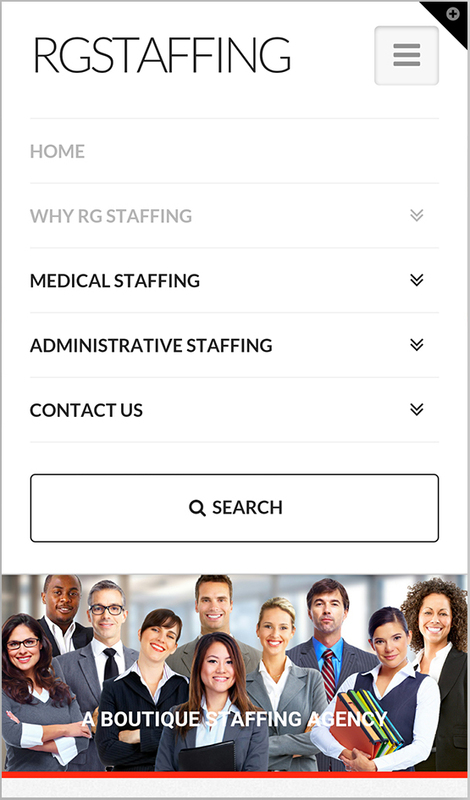 When logging onto the site we wanted a potential client to IMMEDIATELY capture the message of RG Staffing. “Find Work”, “Hire Talent”, and “Contact Us Right Now”. To keep with the theme of RG Staffing’s diversity initiative, Klazzy Kreative also developed a custom hero image to champion the feel of diverse recruitment. In keeping with best design practices, as well as optimal user experience and interface, we developed the new site to be responsive which allows the entire page and all of its elements to resize to fit any screen dimensions. The site is also built to allow optimal functionality when viewed on a mobile device. All aspects of the site still function correctly including our home call to action… the front end contact form. Just as the other elements within the site, the menu is also fully functional within the mobile version. The dropdown tabs are “accordion” style which allows for optimal functionality on touchscreen devices, and the search bar is fully functional as well.